For fans of 123 Andrés, Friday the 13th is anything but unlucky! Today marks the release of the new album, La Luna. Filled with lush instrumentations and gorgeous vocals, Andrés Salguero and Christina Sanabria, the husband and wife duo behind 123 Andrés, have hit a new high with this rich collection that takes listeners on an imaginary trip to South America. 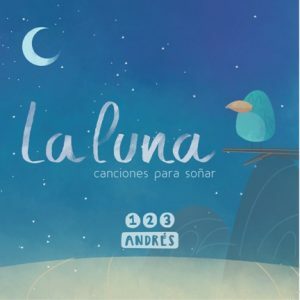 For both Spanish and non-Spanish speakers, La Luna is the perfect accompaniment to those quiet times of the day. To enjoy it, all you have to do is close your eyes and let the music wrap around you like a soft, cuddly blanket while all your worries and cares float away.